A family affair: Jun Anabo with son Kiah Anabo, grandmother Nanay Nora, and cousin Mark Legaspi. At Lucky Three Seven, a tiny Filipino corner joint on a mostly residential stretch of Fruitvale Avenue, Lauryn Hill and Jay Z jams play on the speakers, and all day long there's a steady stream of mostly young folks of various ethnicities picking up to-go orders of lumpia or chicken adobo, or enjoying their meal at one of the tables outside. Painted bold red and royal blue, with yellow banners to complete the Philippine flag, the restaurant is impossible to miss and difficult to resist — especially if you grew up eating slow-cooked stews and lots of white rice. And, in a city where good food sometimes comes with a high price tag and a precious attitude, Lucky Three Seven is as welcoming and laid-back a spot as you'll find. 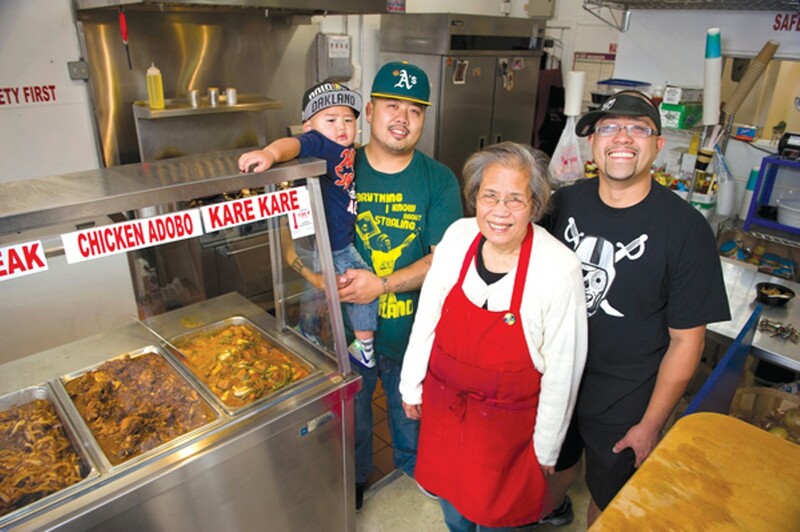 Co-owner Jun Anabo and his cousin Mark Legaspi bought the East Oakland restaurant from their aunt and uncle, who were ready to retire after running it as a deli for years. 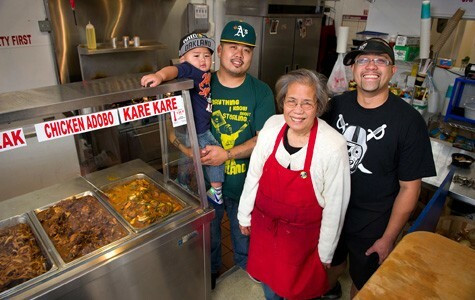 The idea was to serve home-style Filipino food, but to make it accessible to everyone. Anabo and Legaspi wanted to name the restaurant "Three Seven," in part as a tribute to their cousin, nicknamed Pito-Pito ("Seven-Seven" in Tagalog), who was shot and killed last year — and because, like the winning hit on a slot machine, the cousins hoped the restaurant would be their big jackpot. As the story goes, when the business application came back, someone had added "Lucky" to the name. "Hey, it was meant to be," said Anabo, who has an easy swagger and a street-hawker's gift of gab. Of course, they kept the name. The restaurant is a family operation through and through. Anabo and Legaspi work the front of the house, shooting the breeze with customers and giving out tons of free samples. They recruited another aunt, Cielito Buenaventura ("Auntie," as everyone calls her) — the best cook in the family — to head the kitchen. Their grandmother also comes in to cook sometimes, Legaspi is the designated "sous chef in training," and various other uncles and aunties swing by to help out. Most of the food is cooked in advance and laid out in big steam table trays. Each day there are five or six different dishes, drawing from a vast repertoire: torta, tocino, tausi, sisig, kare-kare, lechon paksiw, adobo, and more. Value is a big draw here. With few exceptions, dishes are priced at $5 for a small tub that includes rice; $7 for a large. For $7 or $10, you get that same tub filled up without the rice — a good option if you're ordering several items to share. For most diners, a single $5 rice bowl would make for a satisfying lunch. Probably three-quarters of the dishes are stews or saucy braised meats, and more than half involve pork. The menudo (not to be confused with the Mexican soup) was comfort cooking at its finest: chunks of tender pork shoulder, sweet red bell pepper, and soft-cooked potato. The tausi featured pork belly cooked until very soft in an aromatic fermented black-bean sauce that featured lots of onions, garlic, ginger, and fresh tomatoes. The chicken adobo, made with on-the-bone thighs and drumettes, was a classic rendition — more balanced and less harshly vinegary than most other versions I've had. Ask for an extra scoop of the sauce; it's especially good soaked into rice. There's always pansit (noodles) — often a stir-fried rice vermicelli dish that will resonate with anyone who's ever been to an Asian church potluck. Lucky Three Seven also serves some of the biggest lumpias (Filipino egg rolls) I've ever seen — "X-Large," according to the sign on the window. There are long, skinny pork lumpias and a pudgier version filled with cabbage and corn and just a little bit of ground beef. Both kinds are rolled fresh every morning, fried to order, and come out piping hot — at a dollar apiece, they're a steal. Anabo recalled that before the restaurant opened, his grandmother would cradle these in her hand like barbells, testing their heft. "This is what's going to make us famous," she'd say. It just might. Critiquing food at a place like this feels akin to being invited over to Grandma's house for dinner and then posting your complaints afterward on Yelp. What I will say is this: Some dishes can be a bit too salty; during one visit I passed on the beefsteak I sampled for this reason. And while the restaurant's repertoire is impressive, the offerings are overwhelmingly meat-heavy: The vegetable content of an entire meal might be limited to a few bits of cabbage or shredded carrot. Having at least one vegetable-heavy, if not strictly vegetarian, dish each day would broaden the restaurant's appeal. Breakfast is served all day at Lucky Three Seven, which means the guys will slap a fried egg on just about any of the rice plates on request, though a few breakfast-specific dishes are especially conducive to the treatment. Often there's a tray of the fat little sausages known as longganisa, which are garlicky and sweet. And during each of my visits there was either a beef or pork version of Filipino torta: well-seasoned ground meat stir-fried with peas, onions, and diced potatoes, like the filling for a juicy empanada. The Chinese have a phrase, xia fan, to describe saucy, savory dishes that go especially well with large quantities of rice. I'm told there's no exact analogue in Tagalog, since the entire cuisine of the Philippines is based, more or less, on this principle. A Filipino friend told me the closest equivalent is sobrang sarap, which translates to something along the lines of "much too, much too delicious." "Picture someone smacking his lips with his eyes closed," she said. "That's what sobrang sarap is." It's a phrase I plan to use a lot when telling people about Lucky Three Seven — about the torta, and the menudo, and the chicken adobo. Sobrang sarap. Go eat some now.